As Esther further explains on her website, she plays the mountain dulcimer “in her own individualistic, non-traditional way, perching it on a home-made stand, crossing genres from gentle folk to pop to blues and jazz.” Indeed, the songs on this CD explore many different sounds and moods: from the reflective (“Shibori No Sora) to mysterious (“The Unseen Visitor”), from the magical (“Giggling Star Fairies”) to heart-felt and resonating (“Amazing Grace”). I loved the freeing and healing quality that comes from each track of Esther’s CD. For me, listening was both relaxing and inspirational; more than that, it was a joy. As a young girl, Esther Golton would stay up late listening to the radio. At night, from her home in Philadelphia, she would turn the dials until she found a local folk music show. It was during one of these sessions that Golton first heard the dulcimer. There was something in the texture and feeling of the instrument that she couldn’t get enough of; so with a $500 high school graduation present from her grandmother, Golton purchased her first dulcimer. Born and raised in a family with a deep respect for classical music, Golton saw the dulcimer as her personal rebellion, a way of breaking free of her training in piano and flute, and pursuing something that, for her, held more depth. Introduced to pop music in high school, Golton discovered she had an appreciation for the contribution lyrics made to a song and set off on a different course to become a singer-songwriter. It’s been some time now that Golton has called Alaska home. Twelve years ago, she came looking for the simple life, one that took her to a cabin on a nameless lake of the interior. In the seclusion, without other dulcimer artists to continue learning from, Golton began developing a unique style of play, using the instrument more like a guitar and finding non-traditional ways to hammer out chord progressions. It wasn’t until she gained exposure in the Lower 48, years later, that she realized the intriguing qualities of her self-adapted form. Even while music has been an influential component throughout her life—in addition to her solo work, she’s played in two different rock bands— Golton didn’t begin seriously pursuing a career with her playing until after turning 40. It was then that she realized how much time she’d spent supporting other artists that, while inspiring, had limited the exploration of her own creative process. In 1998 Golton hit the road and began playing both local shows and traveling down to the Lower 48. 2007 saw the release of her first studio album, Unfinished Houses, which has earned a collection of positive reviews from fans and fellow musicians alike. Based in Talkeetna, Golton continues to build her music around an inspiring collection of artists and players, maintaining that there is something special about Alaskan musicians. Perhaps the frank honesty, the independence, or the search for a life uninhibited in the Last Frontier does it, but Golton says she see’s something very distinctive being created by the Alaska music community right now. And by taking her own unique approach to master the dulcimer and the unconventional ways she’s pursued her passion, Golton seems to fit right in. A mountain dulcimer is deceptive instrument to play. Mastering it takes many, many years, but if the player perseveres the possibilities are endless, especially when applied to folk music. Esther Golton did just so and now she plays it like a fully fledged jazz instrument. She knows her way around the flute very well, too. Based in Talkeetna, Alaska living in a log cabin she built her self with her partner, she was one of the founders of Whole Wheat Radio, broadcasting concerts over the internet. After doing this for a couple of years she decided that she would like to perform and record again. She had been gigging from 1998 to 2003, selling a live album called Talkeetna Roadhouse Live. She started writing the material for what would become Unfinished Houses, a title inspired by the fact that log cabins are never really finished. Including three cover songs she recorded for s a side-project ot promote artists that had been featured on Whole Wheat Radio. Esther Colton plays chord progressions that will be tough to duplicate on a non-chromatic instrument. Writing about her every day life she sings about happy memories – sneaking off as a child to ride a horse called Shadu, the need for life “to be filtered” (The Hoedown Philosopher), the sickness of her good friend (Louise) and a pilot that took off never to return (Keli Mahoney). Most of the time Golton is content with her life in a log cabin (Unfinished Houses, All The Room Need). As for the covers songs, she makes them her own with Danny Schmidt‘s Happy All The Time as the stand out track. Esther Colton proves that you can live anywhere and still be heard, coming up with an album that every house (and cabin) should have. Unfinished Houses is a self-released album. Buy it from her website. Golton plays a unique stringed instrument not often featured these days in music, regional or otherwise, known as the mountain dulcimer It kind of looks like a cross between a violin and a very small acoustic guitar, though it has a long, thin shape with two holes on either side of the strings. In this case, the holes are in the shape of hearts, much like Golton’s music, which is full of heart. The instrument is either strummed or picked, making a rich and distinct sound all its own. Golton’s vocals are silky smooth, precise and winsome, especially when accompanied by other voices. She has a fluency to her words that allow the listener to decipher every syllable uttered. Golton has a way of telling her stories that make you feel as if you shared with her in her experiences personally. Golton writes some of the catchiest choruses I’ve ever heard, with these fantastic harmonies quite reminiscent of Crosby, Stills and Nash. Golton’s music has such a rich vibe about it, the kind of sound that sends chills down my spine, because it is like I’ve discovered a secret that the rest of the world will soon find out about. So in the meantime, I will savor in the idea that I found her first. To give this fantastic artist a listen, stop by fabulous Talkeetna and it won’t take you long to find her. Josh Cole is a local musician and CD connoisseur. For a possible review of a new released, e-mail Josh Cole at lettersfromthevoid@yahoo.com or at Myspace.com/familiarwalls. Like Christopher McCandless, Esther Golton and her partner, Jim Kloss, chucked everything and moved into the wild of Alaska. Unlike McCandless, they’re still going strong. Golton is a talented singer-songwriter who plays flute and mountain dulcimer. Kloss oversees Whole Wheat Radio, an Internet station that showcases unsung, deserving independent musicians, which he operates from their log cabin in Talkeetna, Alaska. Golton and Kloss met while hiking the Appalachian Trail. She had grown up in Philadelphia and graduated from Pennsylvania State University with a music degree. While the flute is her specialty, in a fit of classical rebellion she bought a mountain dulcimer with high school graduation money from Grandma and discovered she loves that, too. Kloss was a computer programmer from Columbus, Ohio, who — like Golton — tired of the mess of modern life. They set out for Alaska. “We narrowed everything we had down to what fit in a pickup truck and drove up the Alaska Highway, not knowing where we’d end up,” Golton said. On a bulletin board they found an ad: A tiny cabin tucked away on a lake needed a caretaker. They lived there a year, with no indoor plumbing. They needed to flag down a train to reach civilization, 20 miles away. That was Talkeetna, where they later moved. “I got lonely and missed doing music,” Golton said. She built a 12-by-12-foot cabin in Talkeetna, which lies about 100 miles north of Anchorage. Cold snaps, she said, mean temperatures of 30 and 40 below. And it snows, a lot. “There are two winters I experienced where we were surrounded by 10 feet of snow for a long period of time,” Golton said. Yet, they love it. “It’s great to be in a place that’s less crowded and so beautifully wild,” she said. Golton had enough fans to try a tour. Erie fan David Van Amburg suggested she play Erie and rounded up guests to accompany her. David Blaetz (bass), Phil Papotnik (horns), Julie Hamilton (vocals) and Van Amburg ( guitar) will join her Saturday at the Bel-Aire Clarion Hotel. They’ll play her originals but also the Beatles’ “Norwegian Wood,” which is perfect for dulcimer, and Van Morrison’s “Moondance.” Her voice, clear as a mountain stream, and flowing songs evoke the wonder and reward of living in the wilderness without ever sounding like a billboard or postcard. Golton will share a few stories about her “Northern Exposure” lifestyle. Her cabin still has no running water. But she’d rather live in the wild than in the ‘burbs. Esther Golton will perform Saturday from 8 to 10 p.m. at Victor’s in the Bel-Aire Clarion Hotel, 2800 W. Eighth St. Admission is free. For more on Golton, visit www.myspace.com/esthergolton. DAVE RICHARDS can be reached at 870-1703 or by e-mail at dave.richards@timesnews.com. Sometimes it’s the little things that make all the difference in your life’s direction. Just ask Esther Golton. A serendipitous series of events will have brought this singersongwriter from the foothills of Denali Mountain in Alaska to the foothills of the Smokies to perform Tuesday, Feb. 12. It began when Fountain City resident Angela Hill was traveling through Alaska last summer and visited Whole Wheat Radio (www.wholewheatradio.com), an interactive independent music webcast originating from a log cabin in tiny Talkeetna, Alaska. There she heard Esther Golton, a clear-voiced singer who accompanies herself on the mountain dulcimer. Impressed with Golton’s original handling of genres from folk to pop to jazz to blues, Angela returned to Knoxville wanting to hear more. She e-mailed Esther, who just happened to be planning her fi rst East Coast tour, and helped her get booked at Fountain City café The Lost Savant 6:30 p.m. Feb. 12. A stop in Knoxville would fi t in nicely in Esther’s itinerary – right between Maryland and Alabama! More serendipity: after posting the confirmed date on her Web site, www.esthergolton.com, Esther received an e-mail from another Knoxville fan who had visited her a few years ago and had noted her tour schedule. The message suggested that as long as she was in Knoxville, why not contact the folks who put together WDVX’s Blue Plate Special? Esther then e-mailed host Matt Morelock, and lo and behold, they had a rare opening in their lineup and invited her to be on the show at noon Feb. 12. Golton is a Pennsylvania native and seasoned performer who’s hiked the Appalachian Trail and traveled from Japan to Maine before settling in her self built cabin in Alaska. She had been helping to present other musicians for four years when she answered an inner call to put her own creativity back on the front burner. 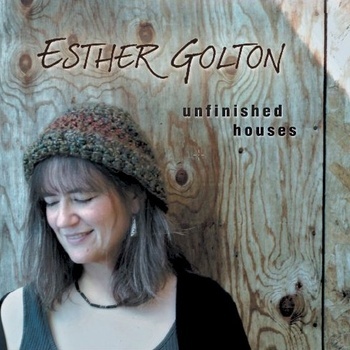 The result was Golton’s 2007 CD Unfinished Houses, which includes some cover songs reflecting her enduring commitment to her fellow songwriters. Esther’s rich and varied life experience has infused her own songwriting with stories and humor, and her dulcimer technique extends way beyond the old-time music tradition. She uses the instrument to coax out interesting chords and textures, all the while anchoring her melodious songs with heartfelt lyrics evocative of her varied life and the Alaskan wilderness. She’s a genuine original, singing tunes that are quirky, poetic and thought-provoking. Folk artist Carrie Newcomer has said of Esther, “It is an act of courage and bravery whenever we send our art out into the world; but the world so needs works of honesty and truth and worth like these.” Catch Esther at one of these local shows, and this rising star might even light up the stage with some improv on her flute. You never know – you might get caught up in a serendipitous event yourself! – Tuesday, Feb. 12, noon: Blue Plate Special, Knoxville Visitors Center, 301 S. Gay Street or listen online at www.wdvx.com. – Tuesday, Feb. 12, 6:30 p.m.: Lost Savant, 5703 North Broadway. Call 689-9990 for info or directions.